Since we didn't manage to eat the whole platter yesterday we served up the leftovers today. 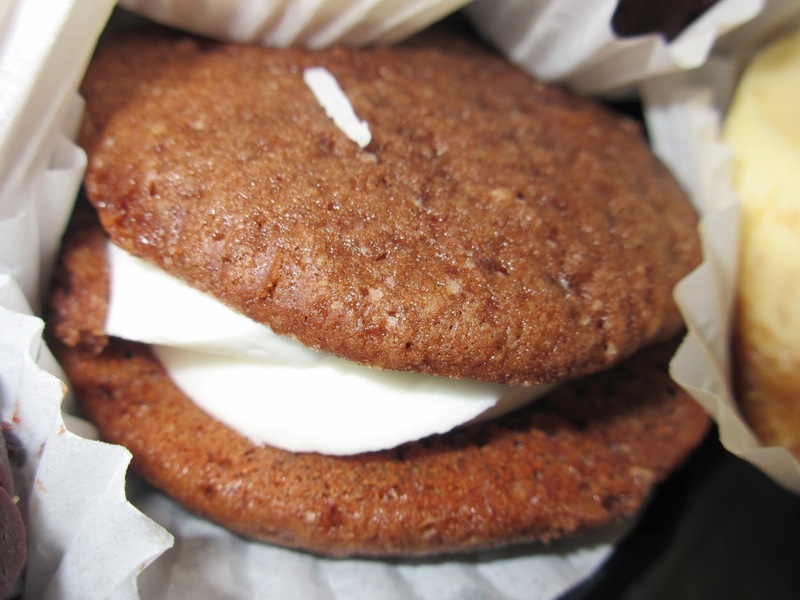 Also we had some leftover Caramel Delight GS Cookies so out they came also. Where did all the cheesecake go..long time passing!! Whoopie and truffle are still around! 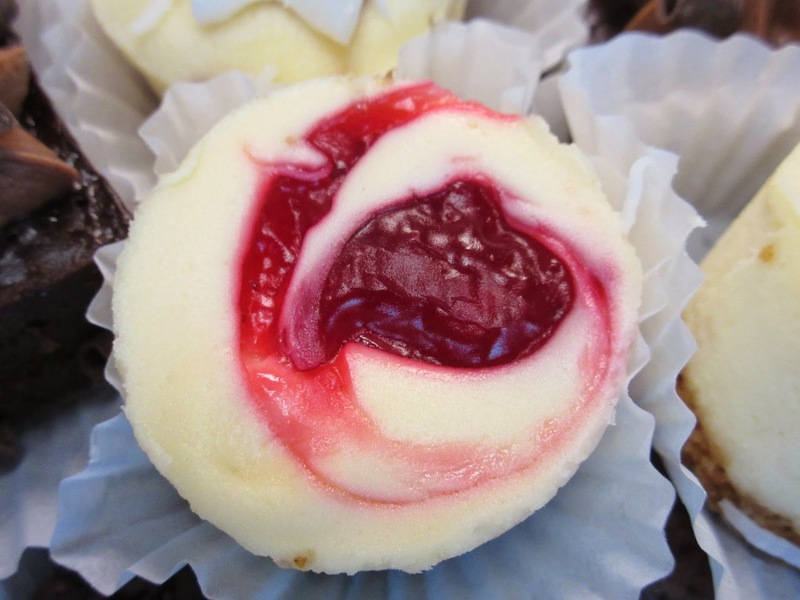 As you can see from what is remaining, the cheesecake treats were favored. There was no problem with these on day 2. The caramel delights would probably keep a long time anyway so nothing was wrong with them, really, except for the fact that everyone agreed they had gotten smaller. We also thought calling them 'Yes, Yes Cookies", as in the past, was a better idea than sticking with the generic caramel delights. Not a ton of caramel and at least "Yes,Yes" keeps them guessing! Like Yes Yes cookies of yore! We frequently make use of Pranzi Restaurant for lunch catering with research progress reports or journal clubs. Some of them offer desserts plates to go along with their lunch. 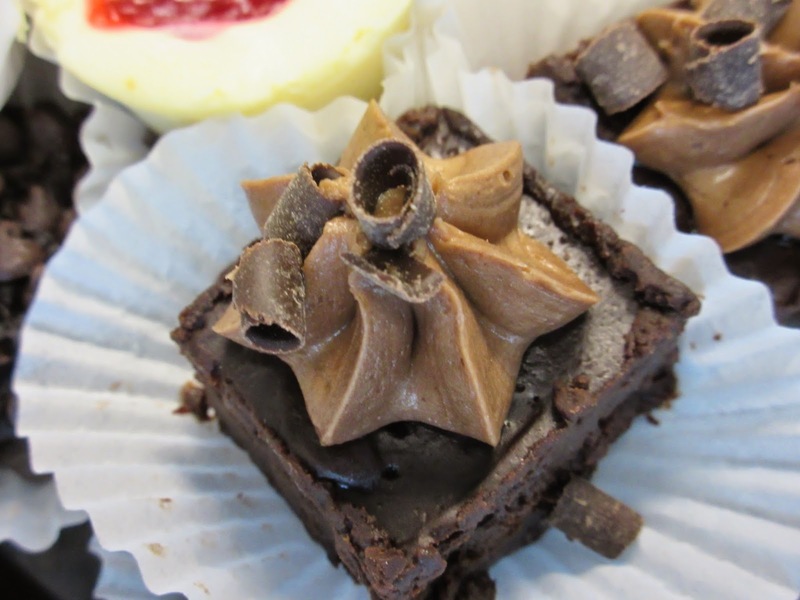 Not wanting to be duplicative, we usually take the treats and serve them up at cake hour! 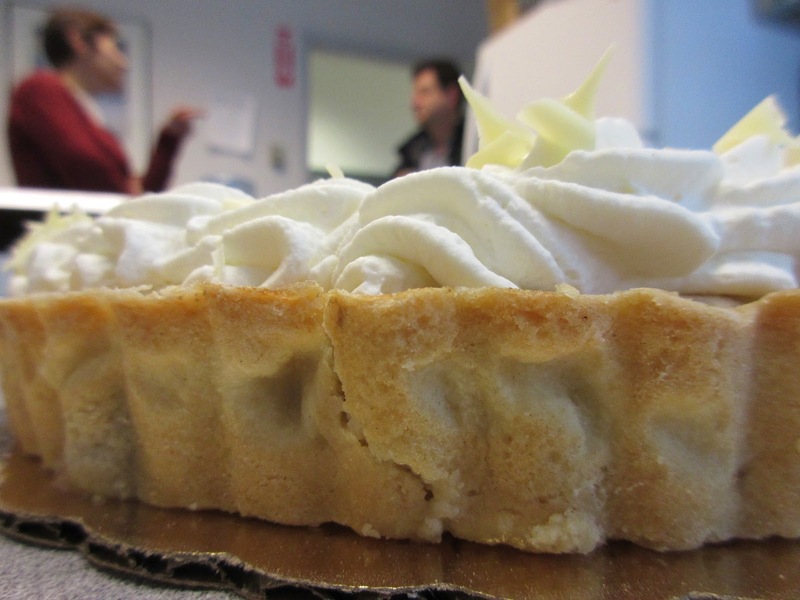 Who needs dessert at lunch when cake time is two hours later. Nice little selection of American mini-treats. 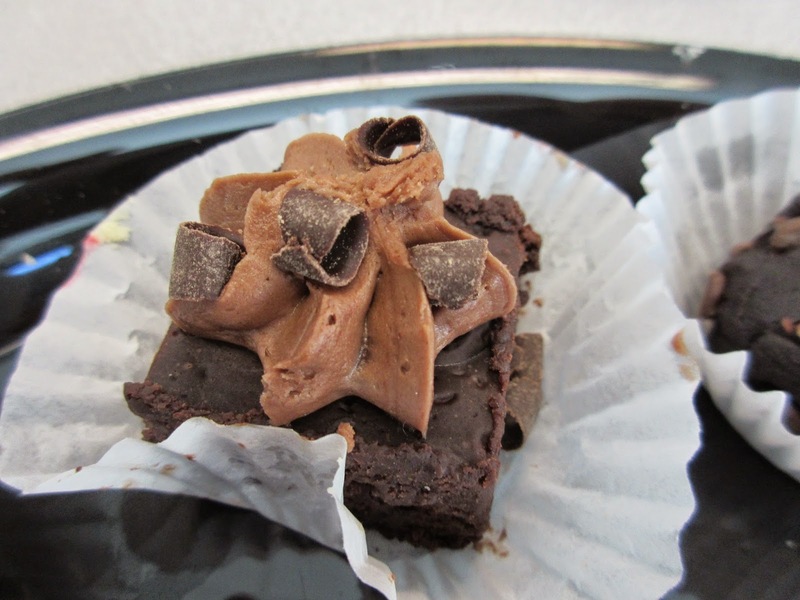 Nice finish atop the brownie! 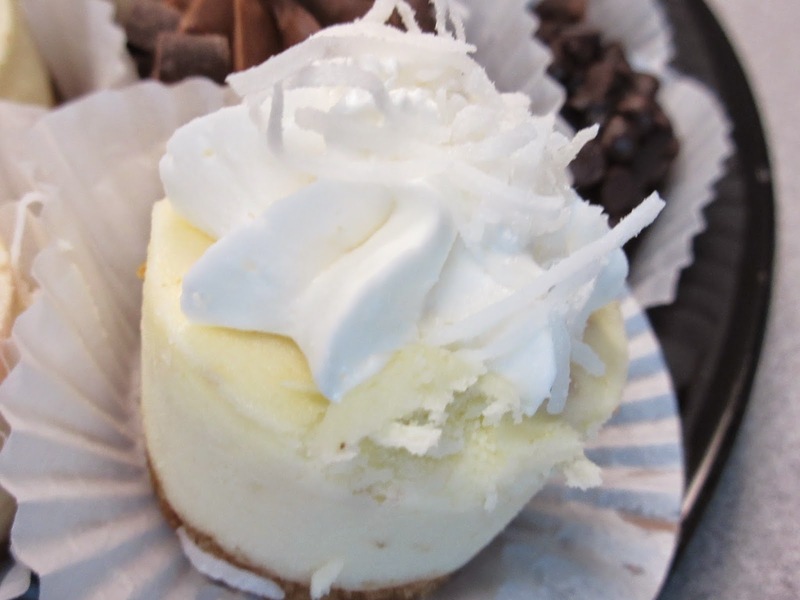 Put a little whipped cream on the cheesecake and we love it! 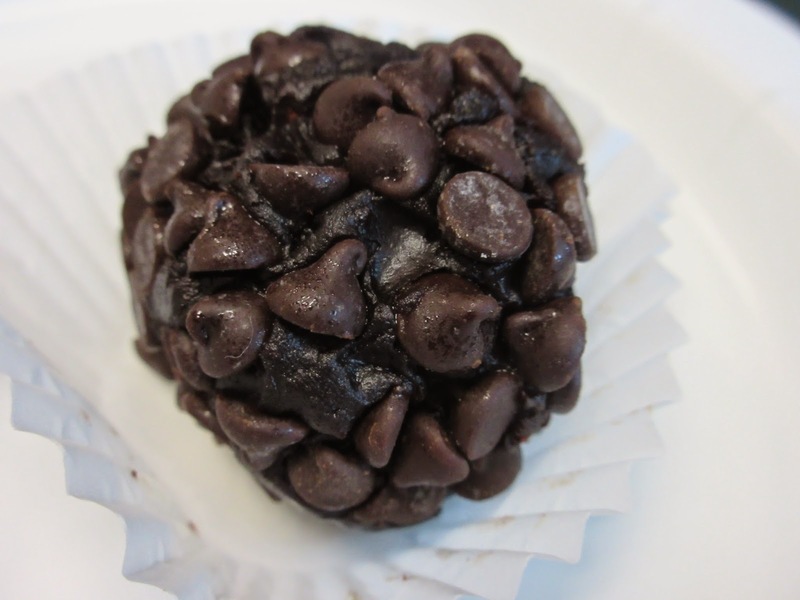 Dense truffle with chocolate morsels! A New England phenomenon according to Wikipedia! 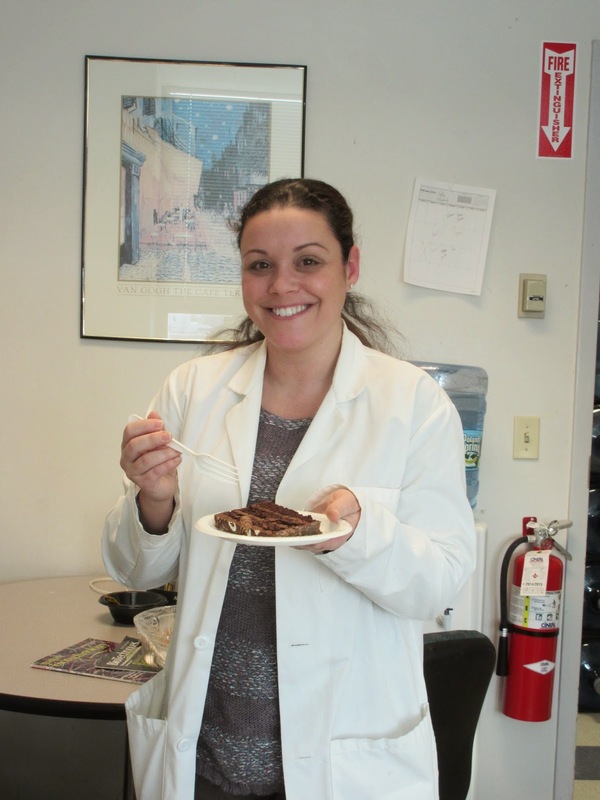 In the interest of modulating caloric content most people tried one or two. All agreed that they were pretty good and that it was fun to try a few different things. 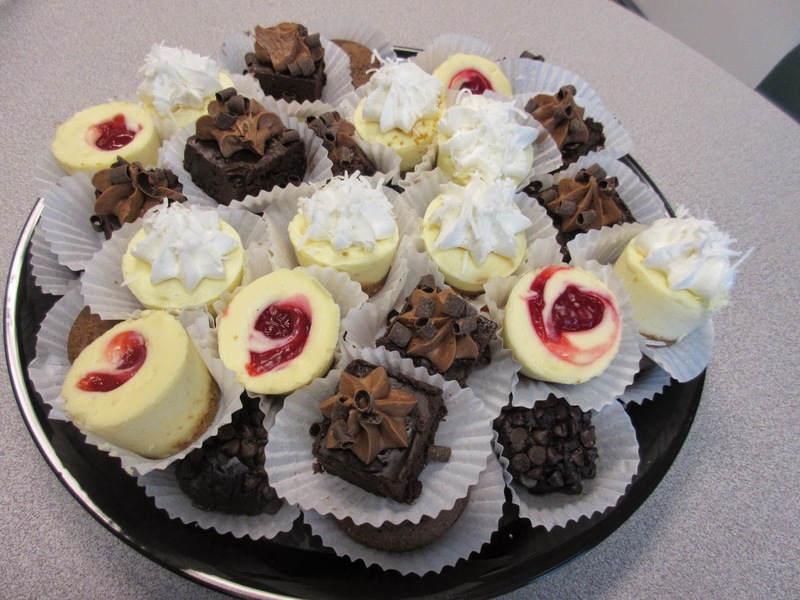 The mini-cheesecakes were most favored although the dense chocolate truffle thing was also well liked. 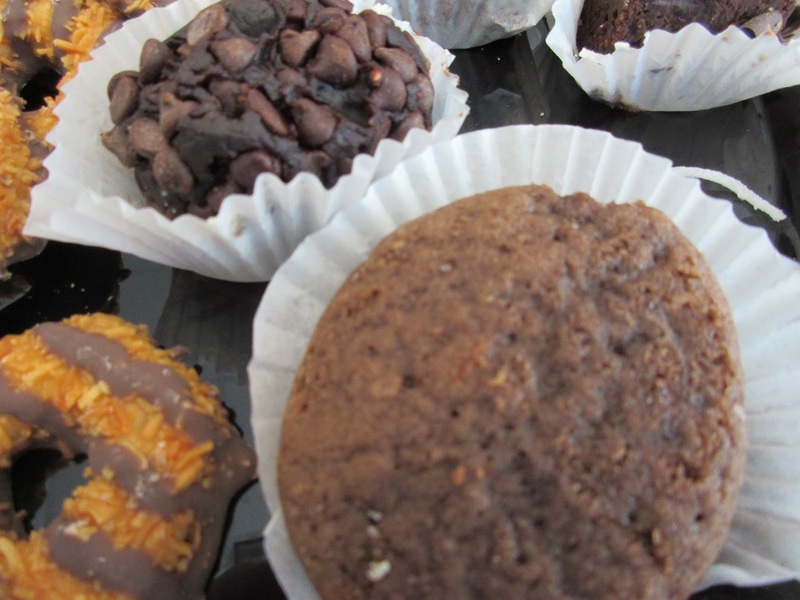 Pranzi's online menu describes dessert platters like "Mini Italian Pastry Platter" and "Homestyle Cookie Platter". This was neither of these and we would call it the "Mini Classic American Desserts" platter or something like that and we certainly recommend it. Hey Ma, are these my kidneys?? 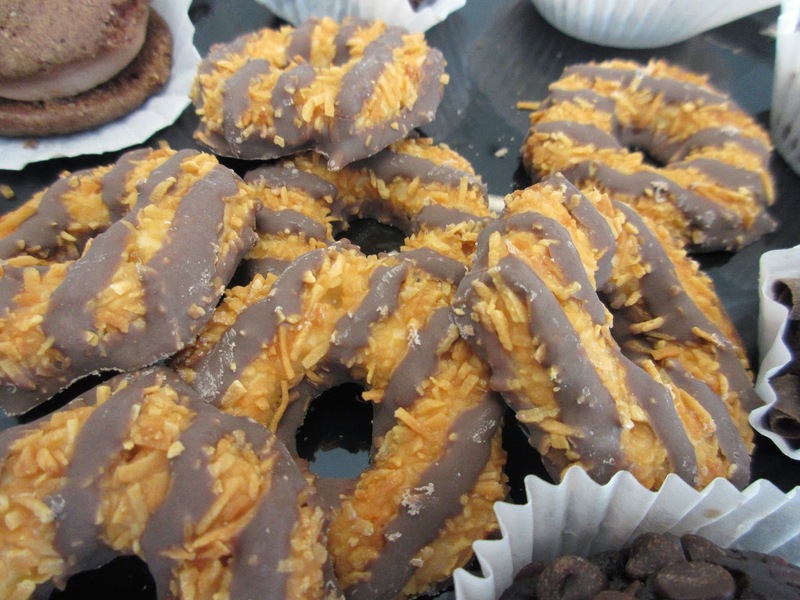 This is the time of year for Girl Scout Cookies. 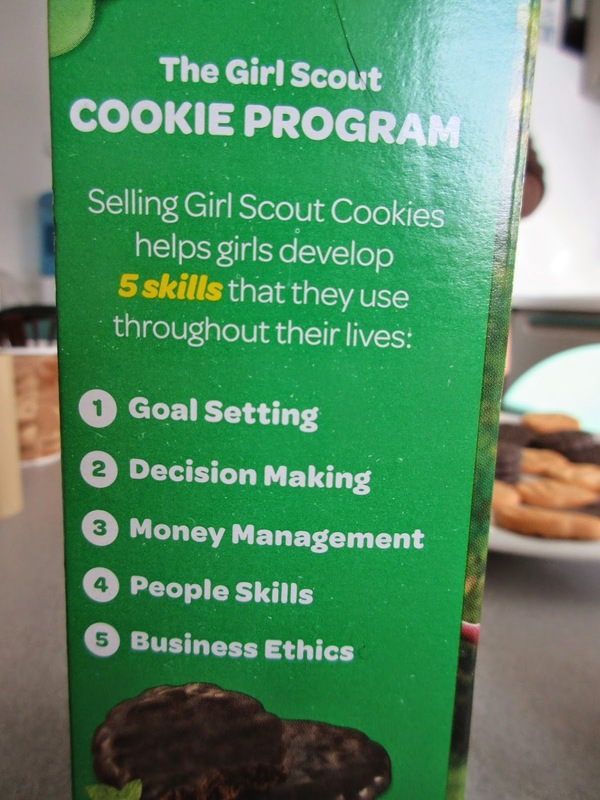 Of course you expect that someone with a young daughter will inevitably come selling the cookies despite all the claims from the girl scouts about how it builds the character of the young ladies. Tell that to the mothers. All this from selling cookies - unless Mom does it! Anyway, a number of us bought and as you will see we will get a number of cake hours out of them. Yup, she got to me too! 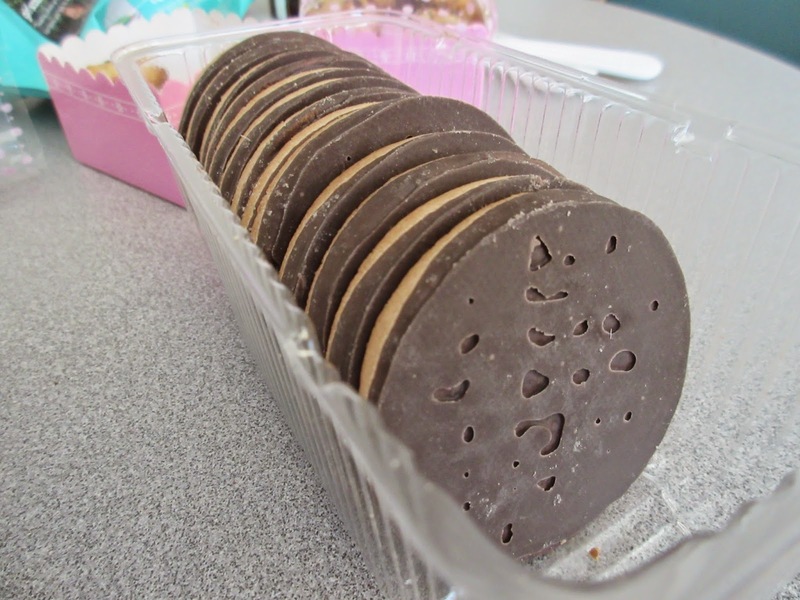 Today we had two of the classics - Shortbread and Thin Mints. What we can say about the shortbread? It is the usual prepackaged mass produced version that is just fine. By nature a little dry so there is probably not the same amount of butter as you might get from Walker's. They aren't bad however and go well with coffee. Not quite the same as Walkers but they will do! 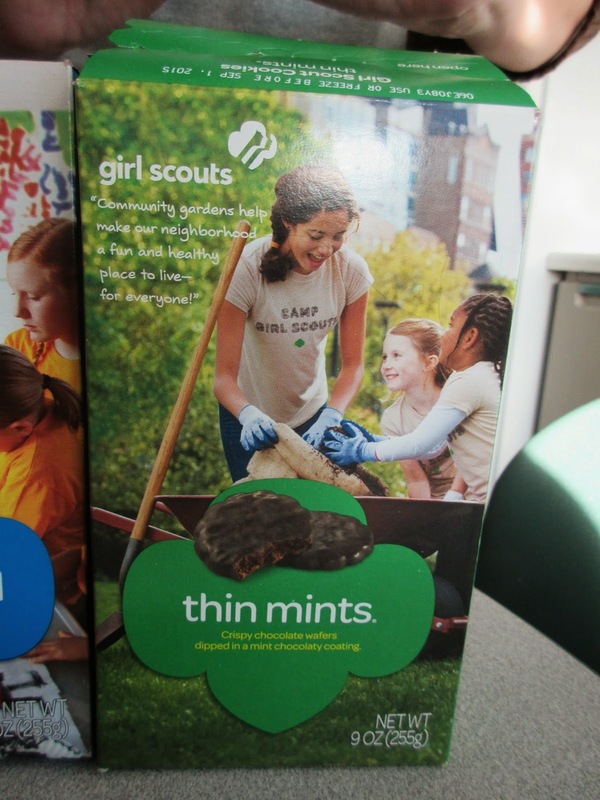 The Thin Mints likewise tasted about the same as they have always. 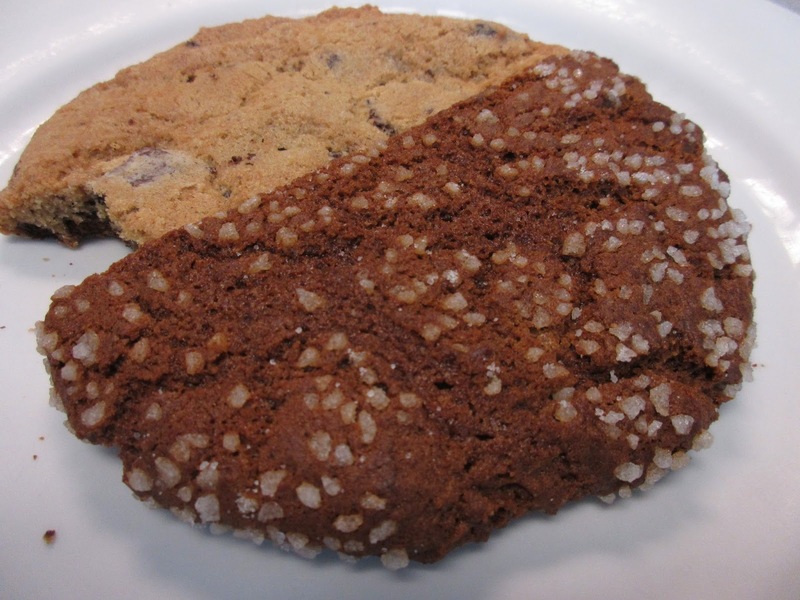 Everyone familiar with them seemed to think that the indentations/holes on the tops of the cookies was something new. Maybe so but it made no difference. This is probably one of the least minty mint cookies that there are. For those that aren't thrilled with mint that is a good thing. Holey different some people think! A decorative spread of the two! 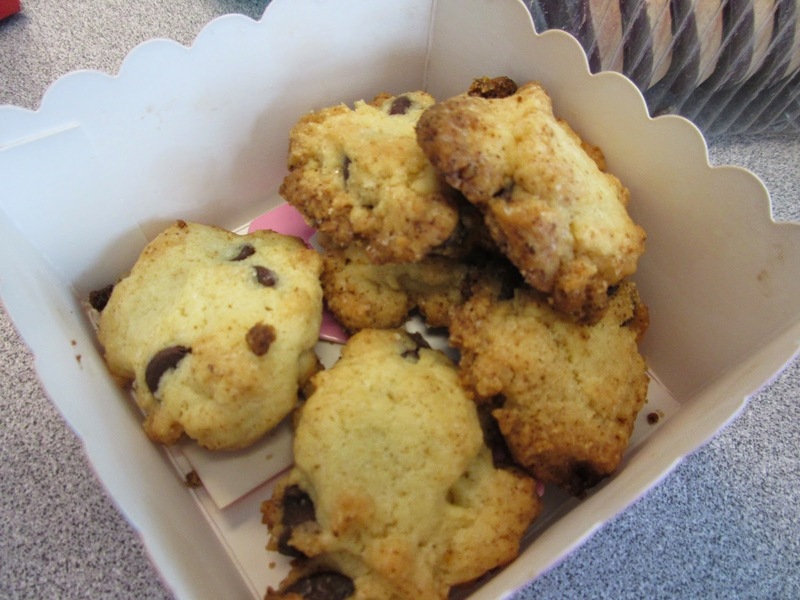 Our colleague providing the cookies has a few young children. They seem to be taking an interest in anatomy and have asked a lot of questions including a recent one "What's a kidney." The answer was that they were an organ that help you pee and you have two of them. The male child subsequently during bath time noticed a few body parts proximal to what he uses to pee and remarked, "Hey, Ma, are these my kidneys?" 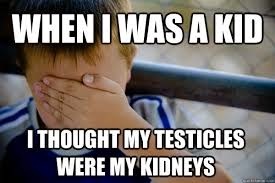 Kidneys they weren't and so Mom gently explained that they were called testicles and were involved in procreation and making babies. At this point the sister piped in indignantly, "What have men got to do with making babies?" That was the end of the lesson! 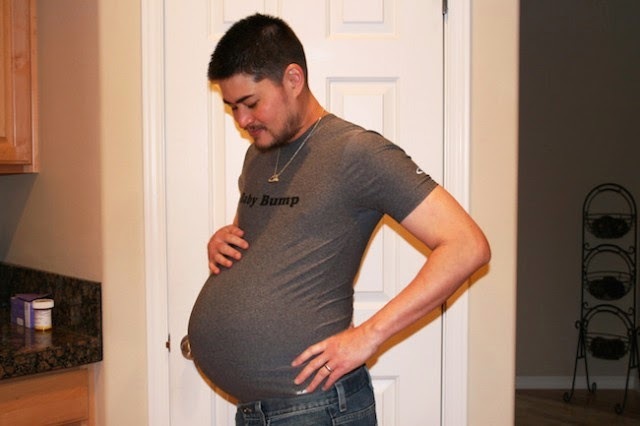 What have men got to do with making babies? Ask him!!! Oh, What a girl can do!! Without a peanut allergy! 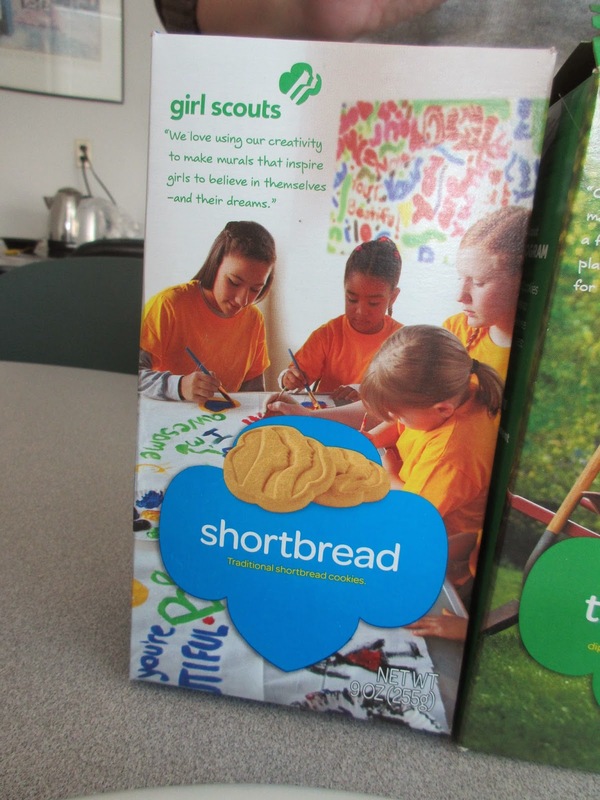 The first part of the title is a byline on the boxes of Girl Scout Cookies. Today we had the red box. 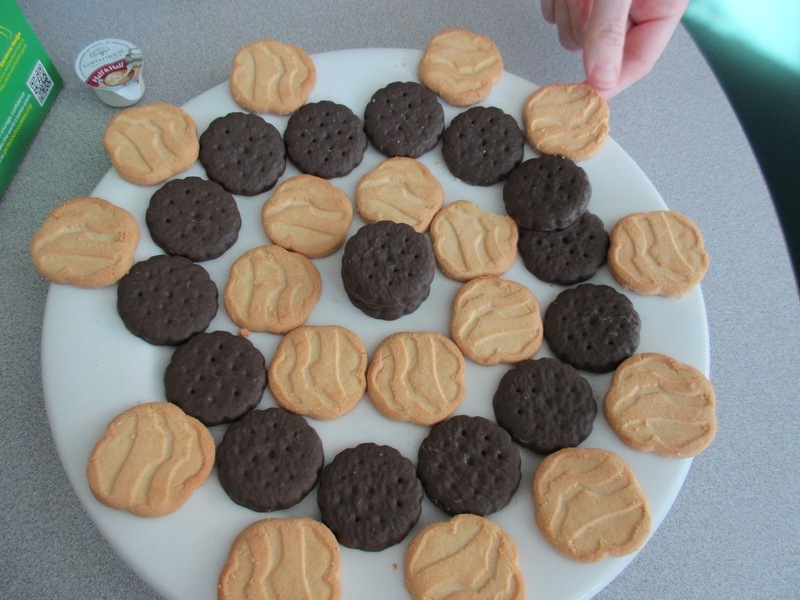 Yes, each cookie type has a different color box. The red box is for the Peanut Butter Patties. 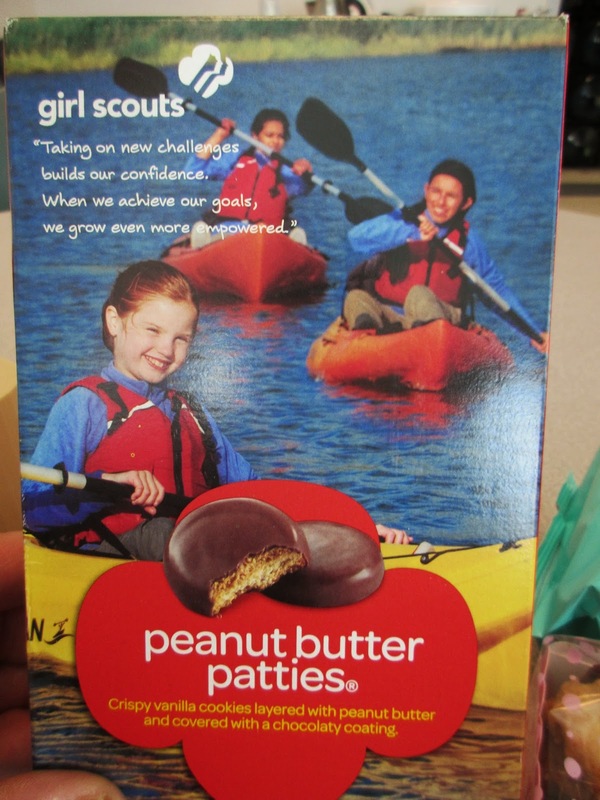 Given the hysteria over peanut allergies we must commend the Girl Scouts for continuing with this product. Clearly they were not being sold at all the schools that now ban peanuts. But there is a recent paper in the New England Journal of Medicine about tolerizing children at a young age with peanuts to see an 80% drop in peanut allergies. Maybe one day the schools will see these cookies. More GS cookies and some leftovers! Saved for a later date allergies or not! The last of the minis. We don't understand why it took so long to finish these. We actually didn't see the cookies, however. As it turns out there were enough of the Thanks a Lot and mini chocolate chips left and too few cake hour participants to require us opening this new box. So we knocked off the leftovers and saved these for a later date. 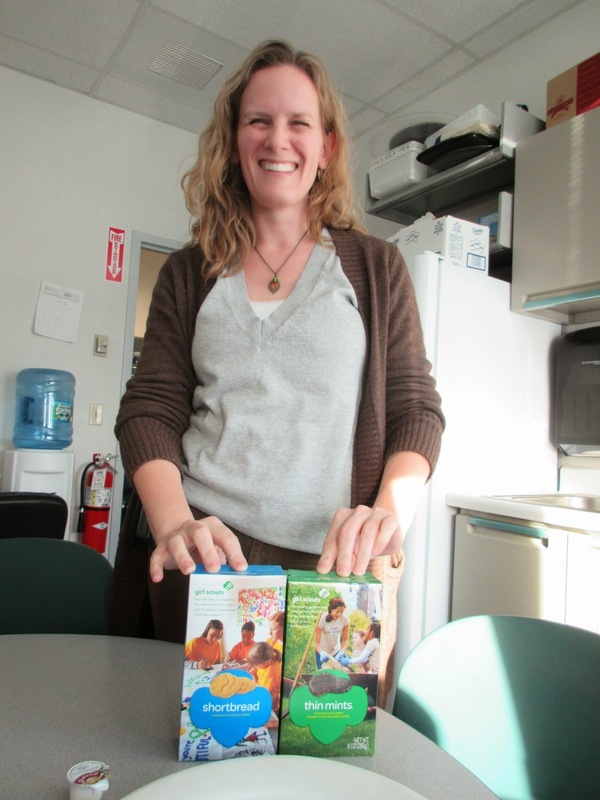 And the Girl Scout cookies are in! 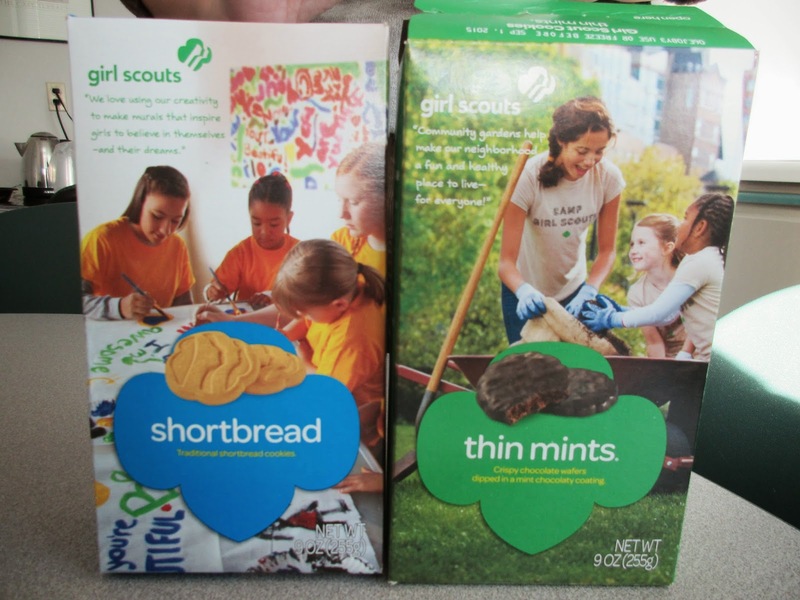 Every year those little ladies in the Girl Scouts get to sell cookies!! This supposedly teaches them all sorts of things including things like decision making and business ethics. That seems a bit of a stretch but everyone plays along when Mom shows up selling the cookies on the girl's behalf. What are coworkers for anyway? 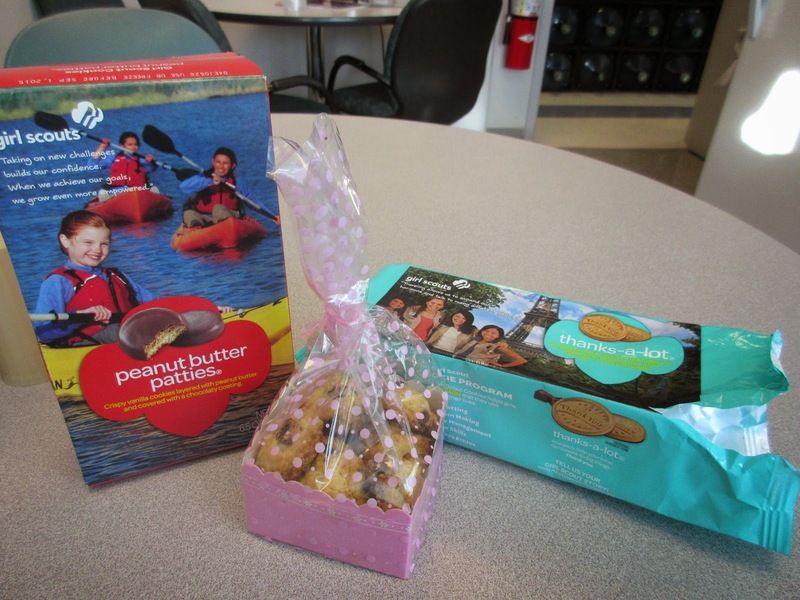 A few leftovers and the first appearance of girl scout cookies! 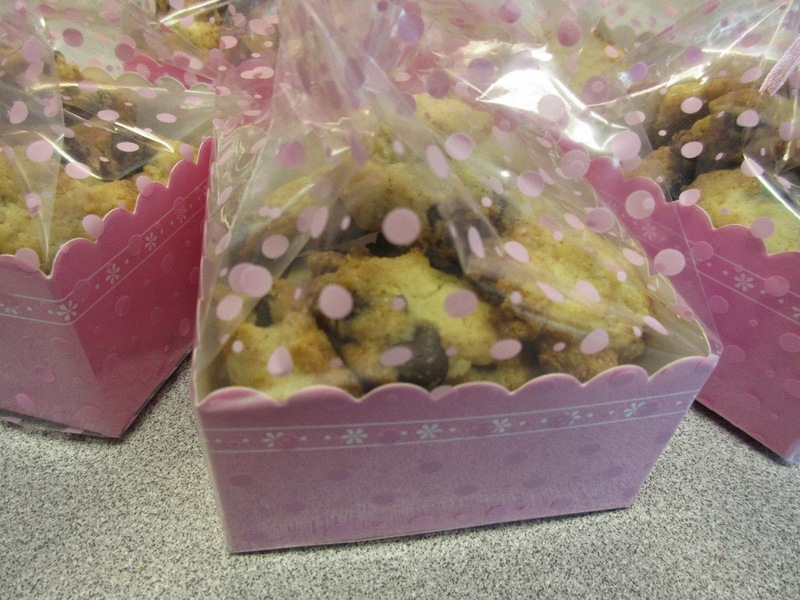 Today we had the first box which was a box of Thanks a Lot Cookies! Don't you love that name? 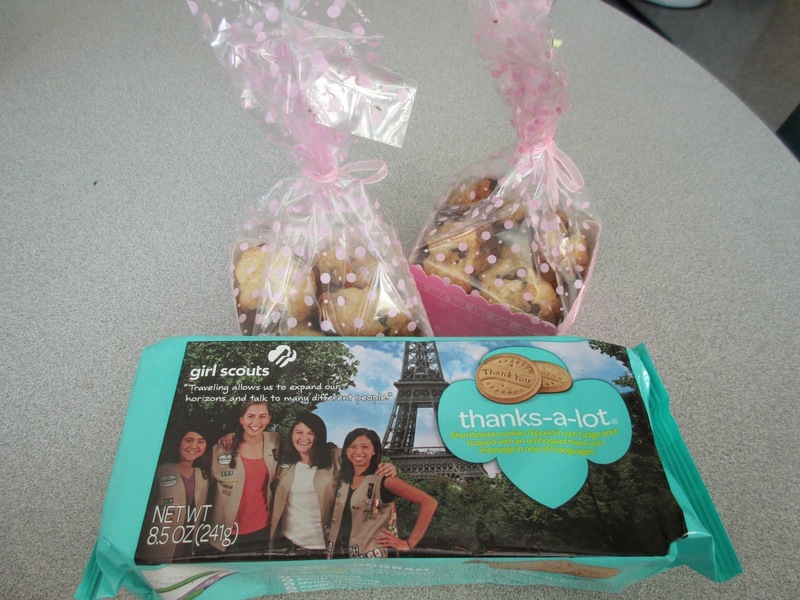 These cookies are a special edition and is a way in which the Scouts say thanks for your buying the cookies. In some respects you are buying their thanks but let's not read too much into it. 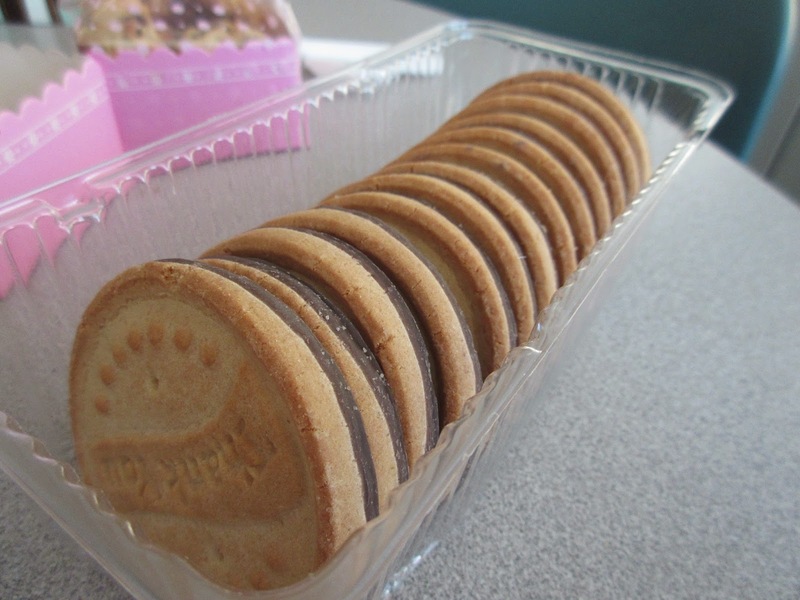 These are vanilla cookies with a chocolate coating on one side. The name of the cookie says it all! 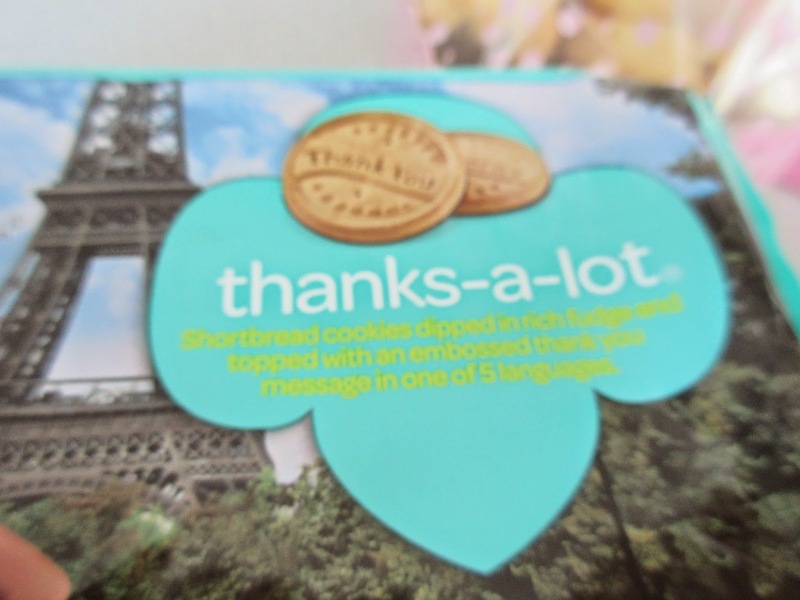 On each cookie the words for Thanks a Lot are embedded in one of five different languages. We have English, French, Spanish, Chinese and Swahili! The choices are very culturally diverse, don't you think? I showed the Chinese one which reads Hsieh Hsieh to a colleague from China and she informed us that the correct Latinization should be Xie, Xie! 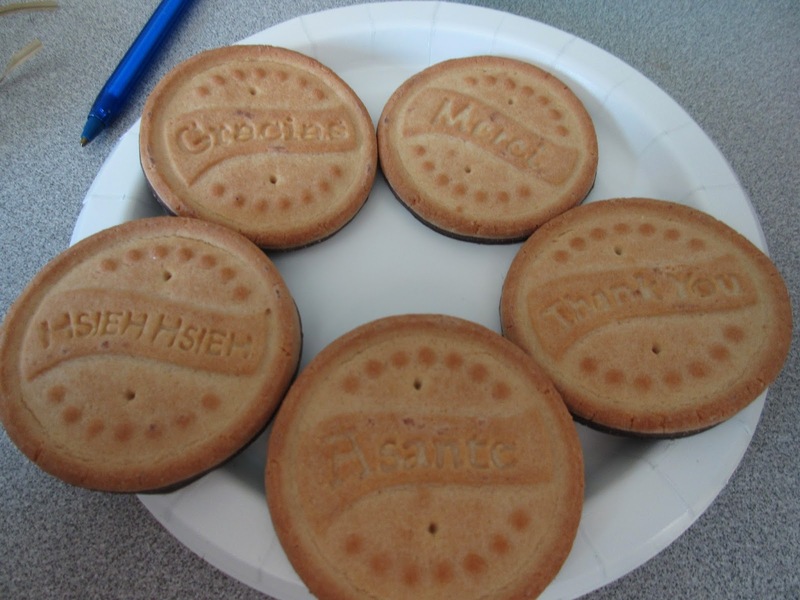 Girl Scouts take note. From English to Swahili - thanks a lot! The cookies were not bad. The chocolate was not much to talk about and truth be told Keebler does a much better job coating cookies with chocolate. The Thanks a Lot chocolate tasted a but too sweet and rather institutional along the lines of cheap chocolate candies that you get at Christmas or Easter. Even if the taste was not remarkable, the cultural awareness was and for that we say Thanks a Lot! A relatively generic chocolate on the other! 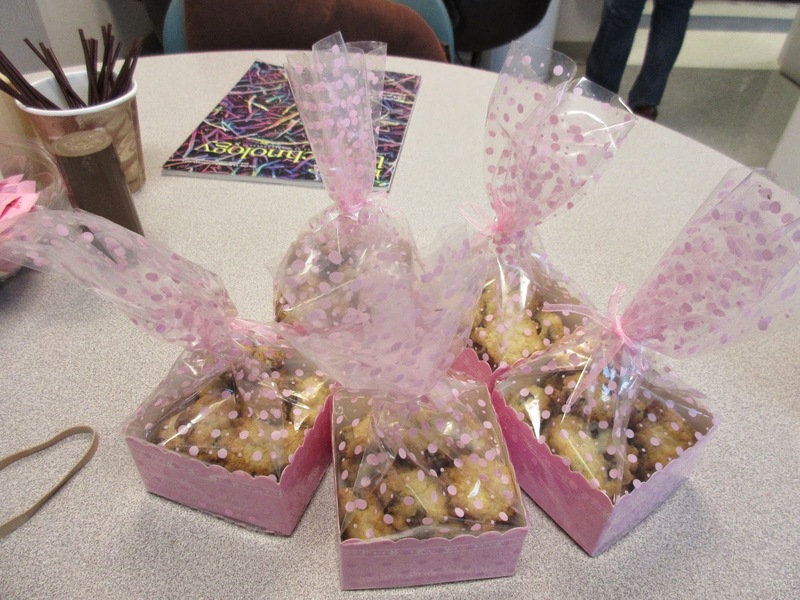 We also finished off some of the remaining mini-cookies which we are also grateful for. Had a few of these left to kill! We had nice little square box of a cake today. It was a commercial product probably from the East Side market or Whole Foods. 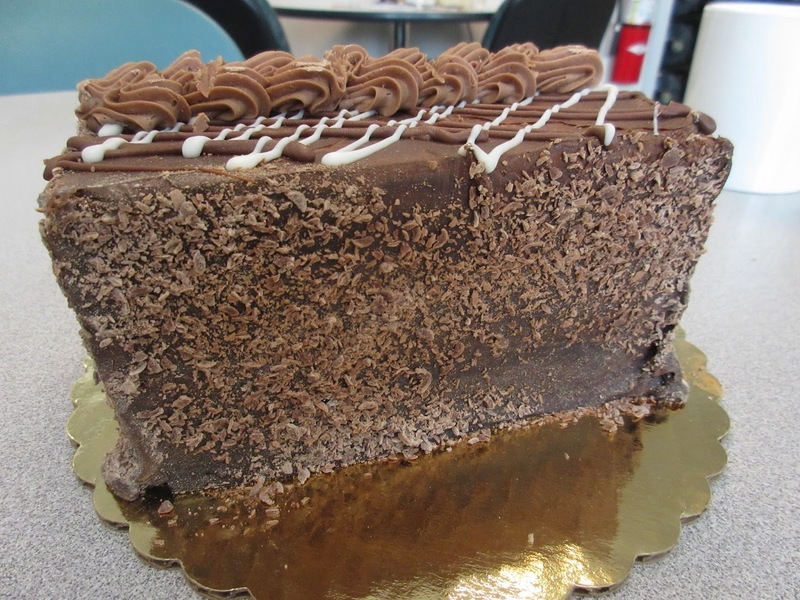 The cake was chocolate with and exterior chocolate frosting that was very firm. 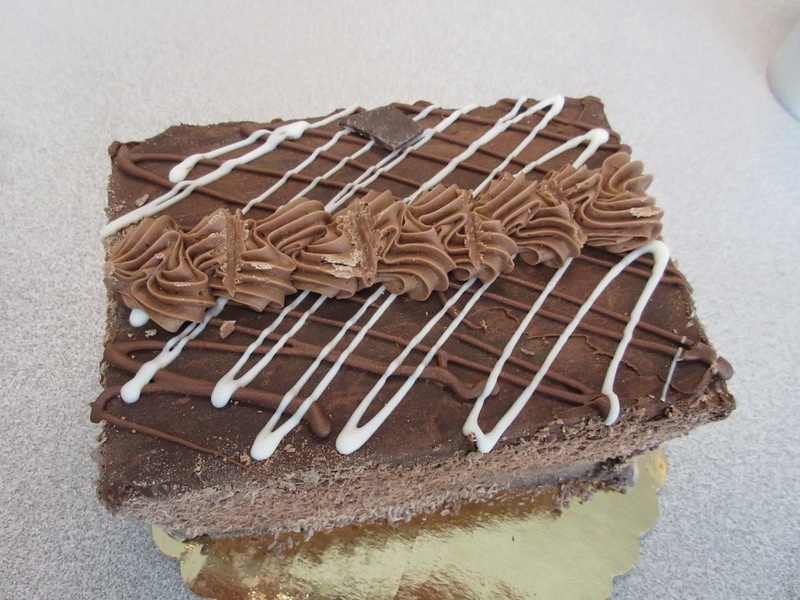 It was layered with frosting in between the layers and was finished on the top with a line of frosting florets and some drizzles of vanilla and chocolate syrup. Finally around the side they included milk chocolate shavings. A lovely little box of a cae! Milk chocolate shavings on the side! A lot of the emphasis these days is on dark chocolate but this was milk chocolate all the way. In that regard the taste was not no intense. 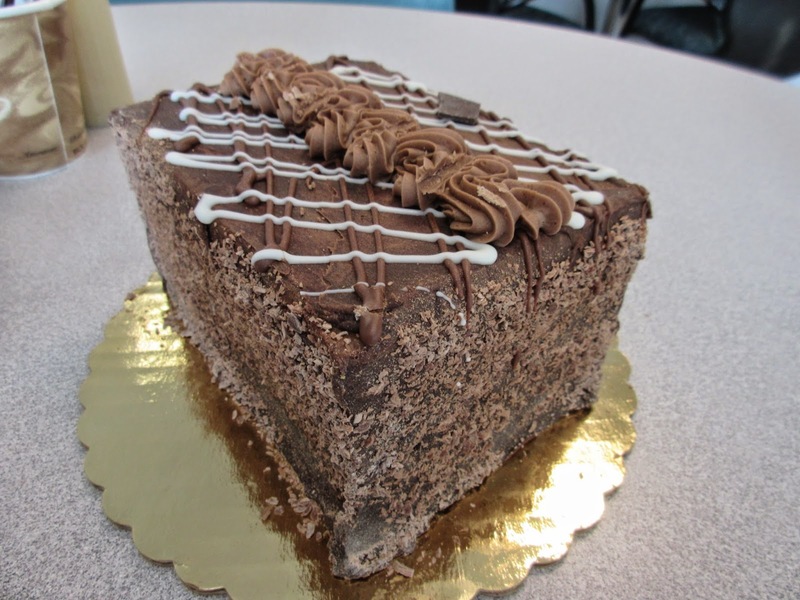 The cake was moist and the frosting, although very typical or a commercial source, was no sickeningly sweet as some of them can be. On balance it was very adequate if somewhat undistinguished. We enjoyed it regardless. Several layers that were anything but dry! 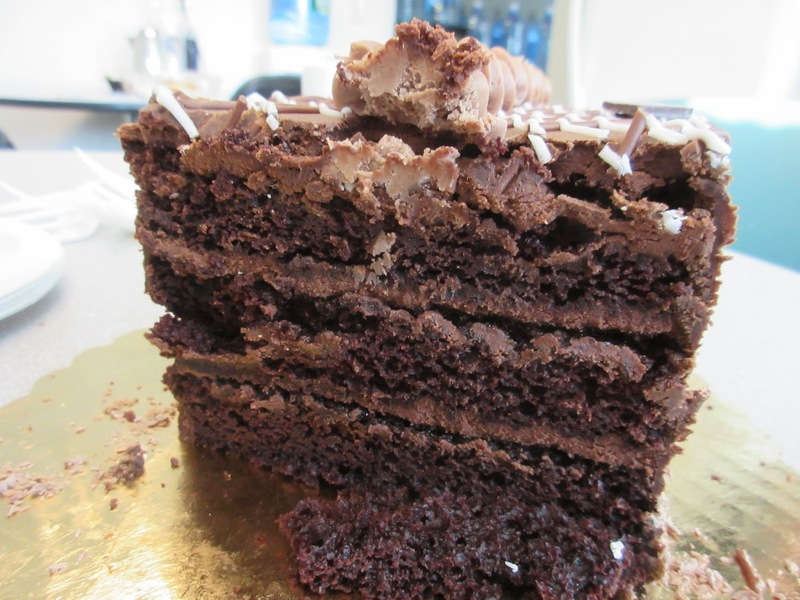 We have a new colleague who has been very good about refraining from the guilty pleasures of cake hour. But she couldn't hold out forever and today she succumbed and had a piece. I guess you could say we corrupted another. Another one takes the plunge! 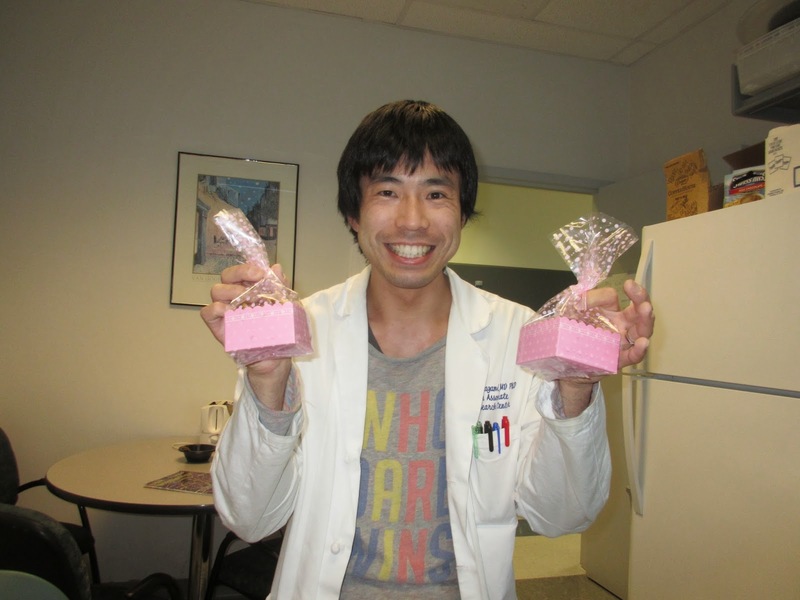 One of our colleagues from the Land of the Rising Sun signed up to bring treats today. We were expecting the usual kind of treats from Japan. These tend to be very carefully made and very intensely packaged. 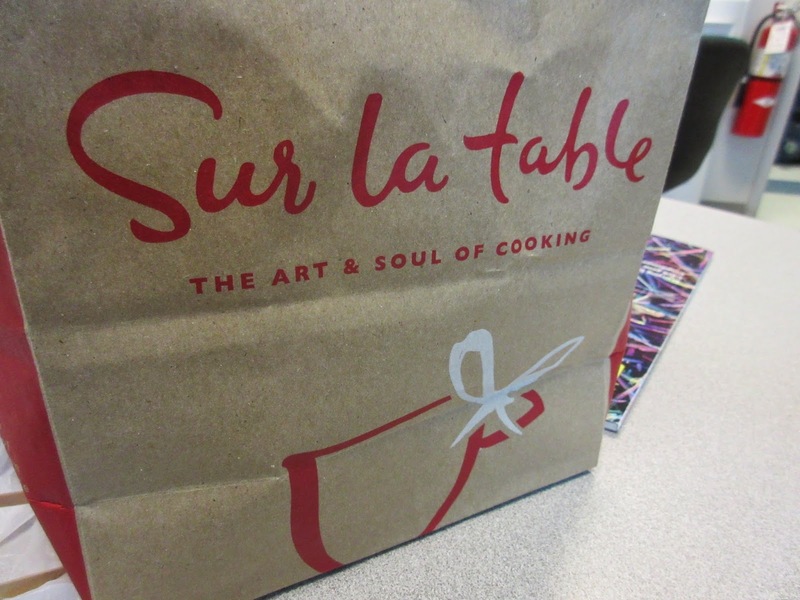 What we got however were things that were indeed carefully prepared and very cutely packaged. 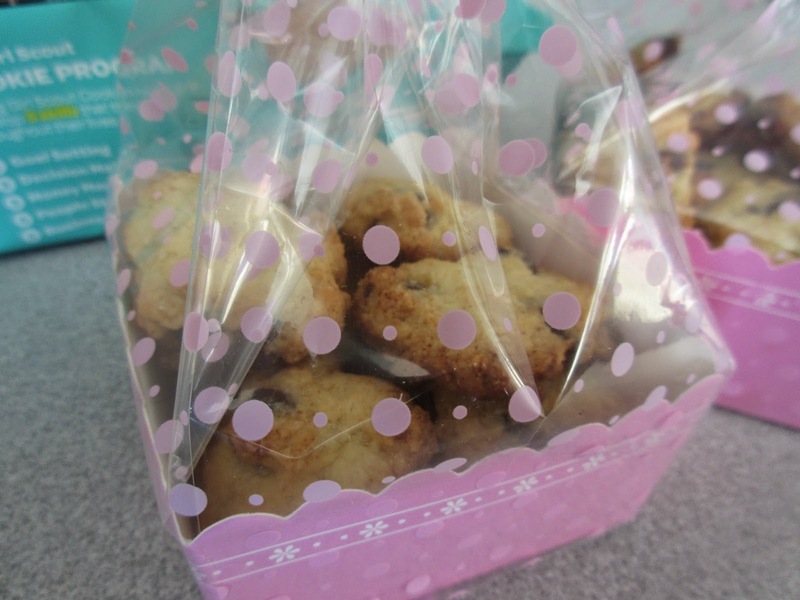 Instead of a typical Japanese treat made from beans or something like that, our friend's spouse prepared some very delicate and small chocolate chip cookies and then packaged them in several boxes wrapped in cellophane and tied with a ribbon. The presentation was very cute for sure. It's just a bag - not where the cookies are from! 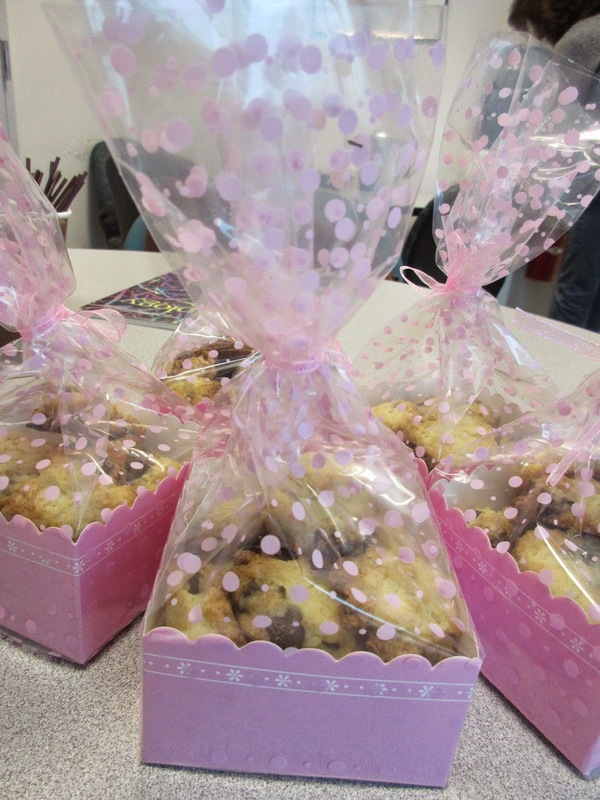 Inside were many well wrapped boxes of mini cookies. The Japanese are known for their creative pacakging! 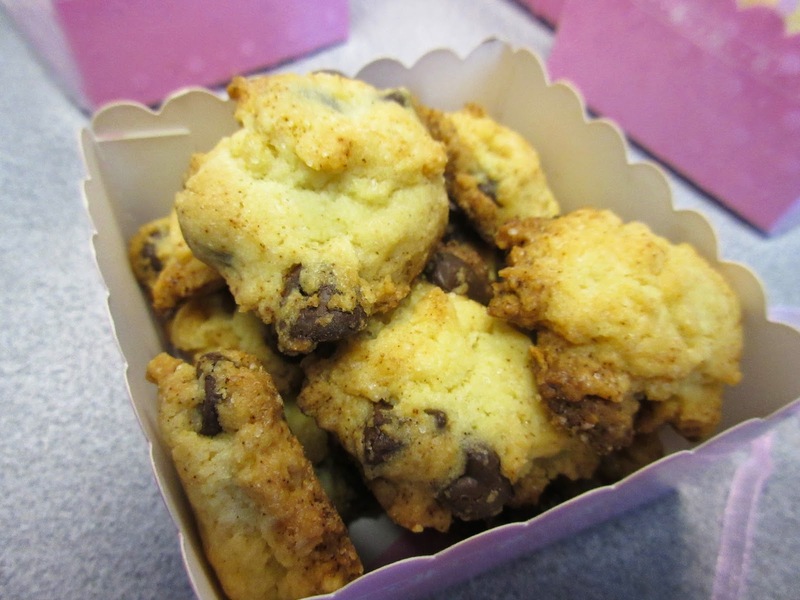 Japanese take on American cookies and no beans involved! The cookies themselves were bite size, freshly baked cookies and oishii or delicious. 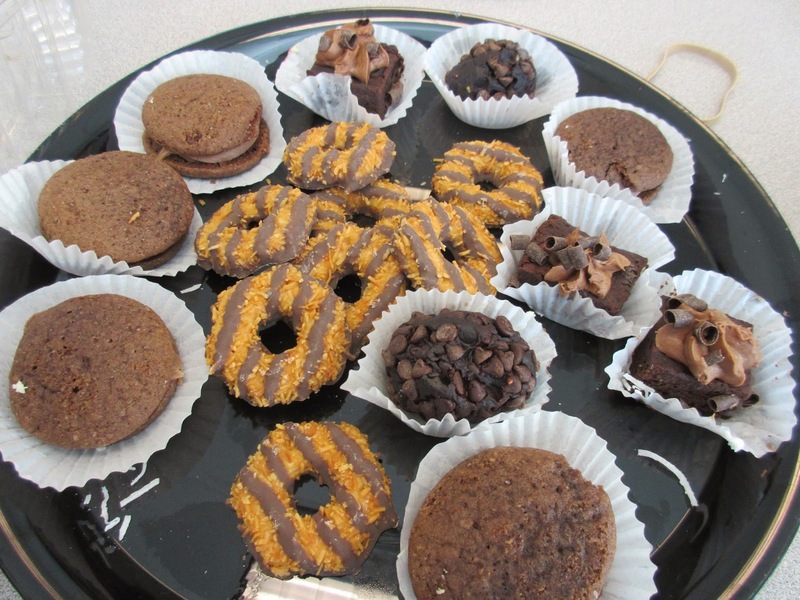 The recipe she found or concocted did not have as much sugar as most recipes do and so the mini-cookies were thereby nowhere near as sweet as some can be. Everyone agreed this was a good thing and ate a few more than otherwise! We were happy to see and try a unique take on a classic American treat. Not your usual chocolate chips! Not too sweet so more to eat!! We celebrated a birthday today. The honoree is not a fan of sweet cakes and sweets in general so the choice was some ice cream and a few cookies. We were all set to go at 4pm as usual with only a slight problem - the honoree didn't show. This is not the first time it has happened. Some people are either embarrassed or just don't want to celebrate. Rest assured, though, that doesn't stop us. So were dutifully sang "Happy Birthday" with the person in absentia and them went ahead and had our treats. 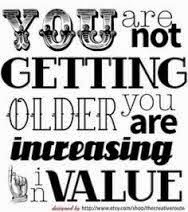 Message for those that are birthday shy! 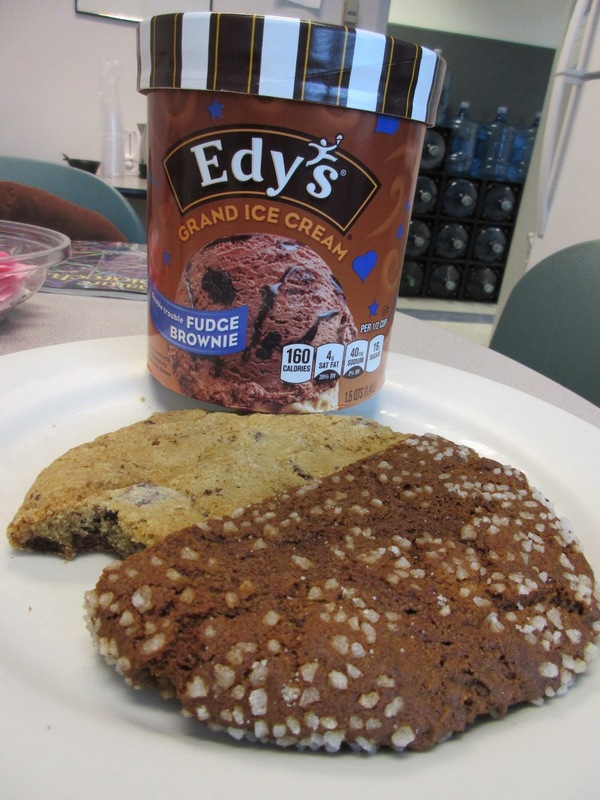 Our procurer for the day opted for some Edy's ice cream, chocolate brownie, and a few cookies. Make that - half cookies. 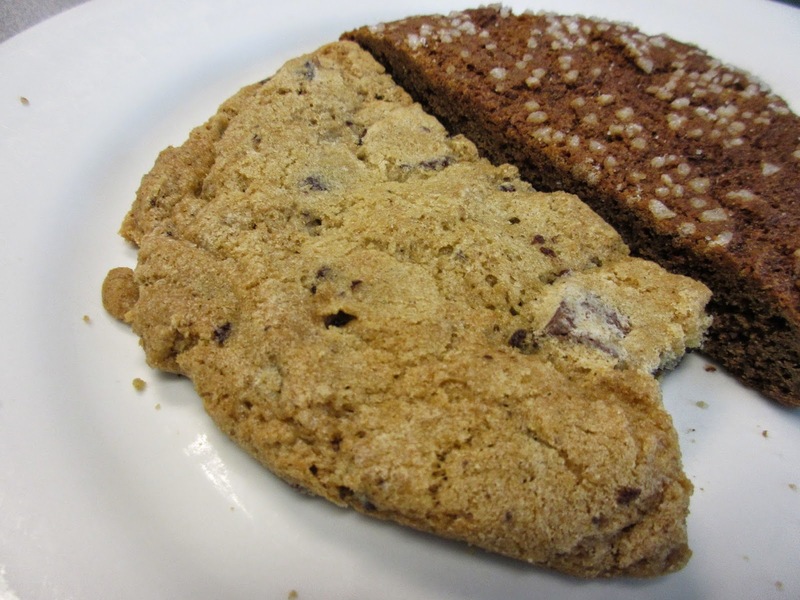 Who knew there is a place that will sell you half a cookie. 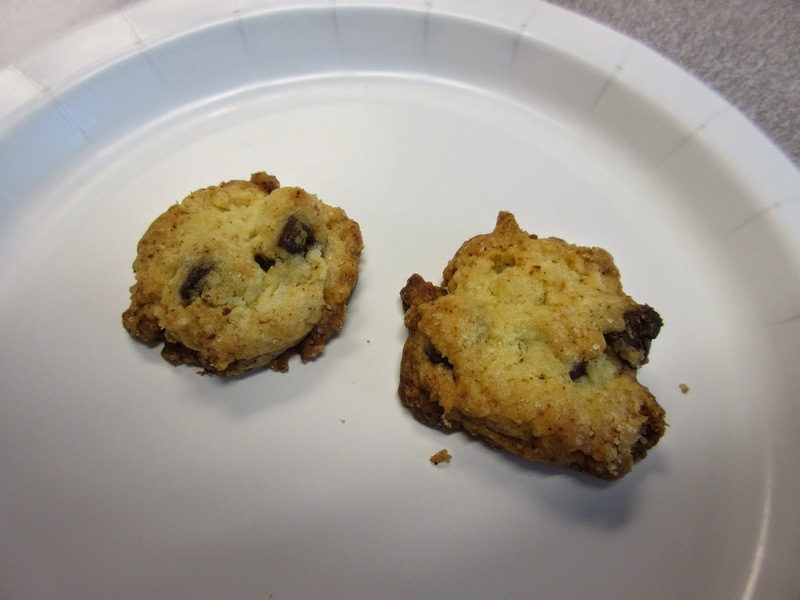 Then again these half cookies were large enough for us to conclude we wouldn't necessarily want a whole one. So I guess we were fine. The chocolate chip version had a piece broken or bitten off. It made for a compromised presentation for sure. The selection for the unattended celerbration. 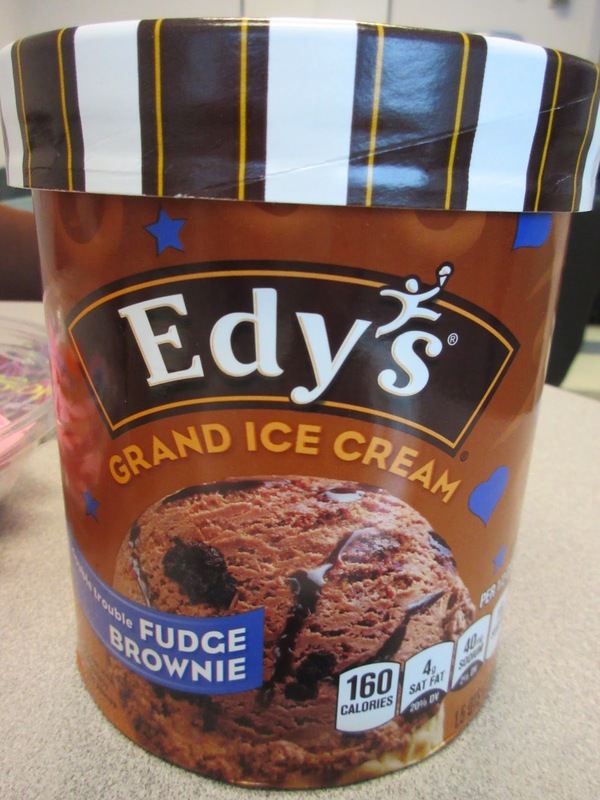 Very chocolatey and very good! Did someone take a bite out of this one? The other cookie we could not identify. The purchaser thought it was a ginger or spice cookie. Others thought it was a brown sugar/caramel type cookie since it did not taste very spicy. The sugar crystals on the top also were more reminiscent of the latter. Not chocolate and not spice - brown sugar cookie maybe? They both fit with chocolate ice cream so we were quite alright. After most of us left the honoree arrived and had some ice cream at the after party. This is when the timid or those feigning disinterest show up and eat the remainders. We're glad she got to celebrate a bit and wish her a great year! 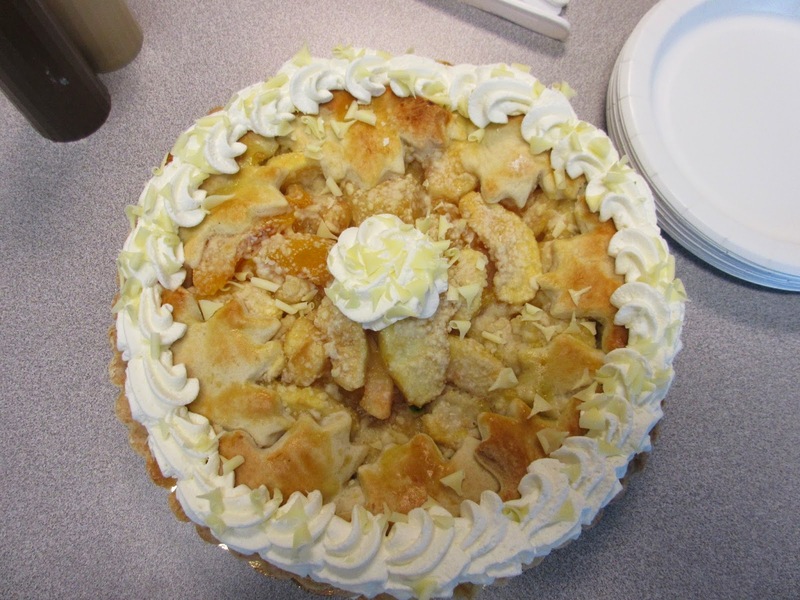 The Vienna Bakery does it again for Lincoln's Birthday! 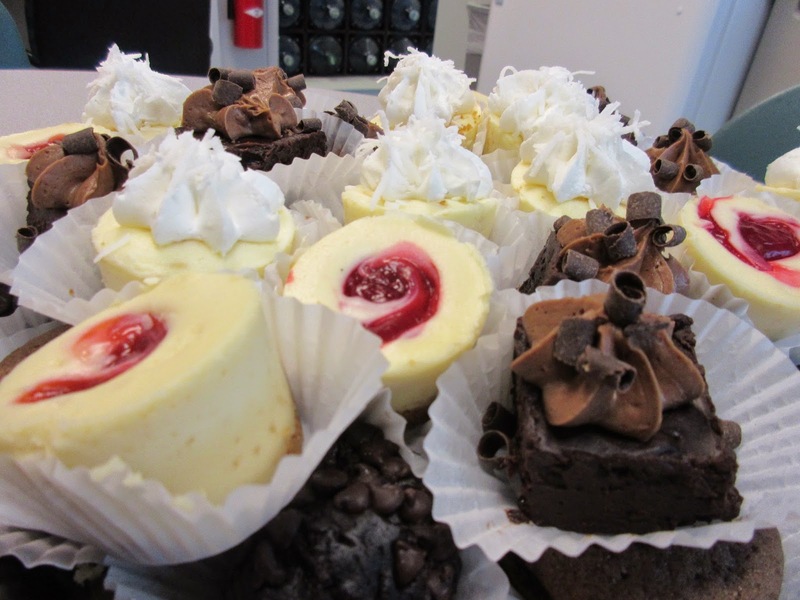 The Vienna Bakery in Barrington, RI makes many different kinds of cakes and we have had a lot of them. They do not rest on their laurels, however, and come up with something different and good every now and then. 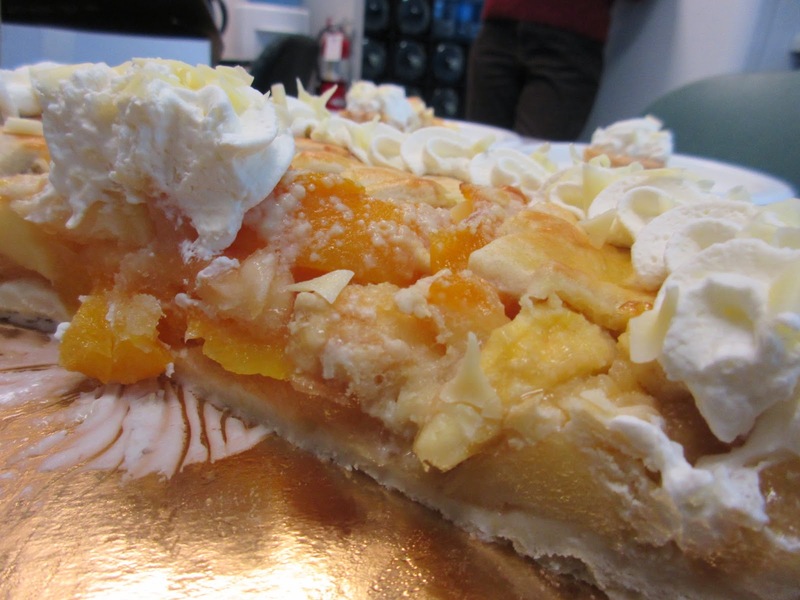 Today we had a variation on a fruit tart. 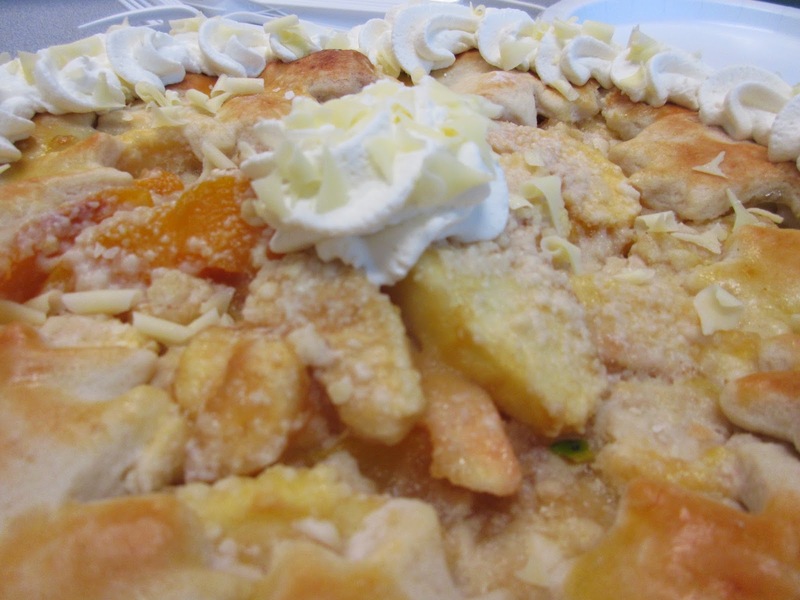 This one contained apples, pears and peaches which turned out to be a great combination! Great whipped cream decoration - always a plus. This consisted of a basic pastry/pie crust which they always do a good job with. Then there is a thin layer of custard to support the fruit. Finally it is topped with generous amounts of the three fruits mentioned. They are covered with a dusting of powdered sugar and some white chocolate shavings. Finally a ice decorative ring swirl of whipped cream and white chocolate adds a decorative touch. This cake was very good and quite a treat for all. Despite the title of the post, it had nothing to do with Lincoln's birthday. 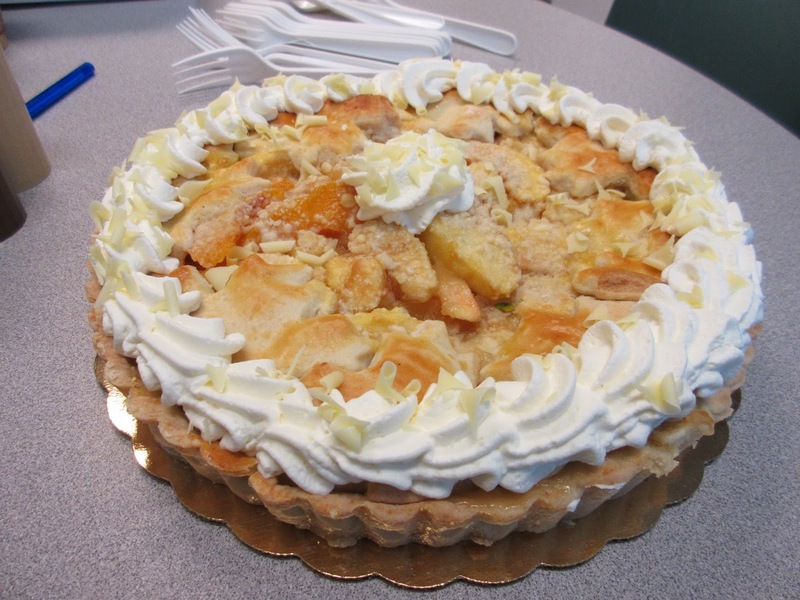 Apples, peaches and pears - great combo! Custard and lots of fruit!